Odysseus and his men are stranded on Helios’ island. Odysseus warns the men that they may not eat Helio’s cattle for fear of the fierce god’s retribution. After a month of continual storms and gales, the food has run out. Dehydrated and hungry, Odysseus and his men are faced with the decision to face an excruciating death by starvation, or take the risk of eating the forbidden cattle. While Odysseus withdraws to the interior of the island to seek guidance from the gods, the men are left without his guiding leadership. What does Eurylochus say to persuade Odysseus’ men to slaughter and eat the cattle of Helios? Do the members of the crew deserve the punishment they receive for killing the cattle? What role does Fate play in events as they unfold? Is Eurylochus a hero? Why or why not? Eurylochus wants to choose his own death. What does this say about him? How is Odysseus not heroic in lines 899-902? What speech does Helios (the sun!) make? And what reply does Zeus make? What are we to learn from each of these? Why does Odysseus have to go back through Charybdis? Why is this important? Please remember to include specific text-based details to support your claims and proofread your writing for grammar, spelling, and punctuation. Posted on February 8, 2018 by equinson	• This entry was posted in Mythology. Bookmark the permalink. In today’s reading of the Odyssey, Odysseus and his men arrive at the land of Helios and his cattle. Odysseus specifically tells his men not to eat the cattle, yet they do not listen. Unfortunately, storms occur on the island, so “one day I withdrew to the interior/ to pray to the gods in solitude, for hope,” (page 1011). While Odysseus retreats to pray to the gods, one of his men, Eurylochus, convinces his fellow sailors to eat the cattle of Helios. He says, “All deaths are hateful to us, mortal wretches,/ but famine is the most pitiful, the worst/ end that a man can come to…. We’ll cut out the noblest of these cattle/ for sacrifice to the gods who own the sky.” (page 1011). It becomes clear, he says, that death is the only end this journey will come to, and eating the cattle will be the easiest way to go. The men agree, and kill the cattle. Helios soon finds out and rushes to Zeus, demanding these men be punished. He talks of how he loves his cattle, and making these men pay. Zeus promises to use a lightning bolt on the men who ate the cattle. Meanwhile, as Odysseus and his men leave the island, a storm sent by Zeus strikes them and his bolt sends the ship flying, killing all but Odysseus. Odysseus is then forced back to Charybdis, which he eventually overcomes. As the story ends, he makes his way to the island of Calypso, where he will be trapped for the next seven years. This story reveals a lot about the men of Odysseus. First, the speech of Eurylochus shows how desperate they are. Eurylochus saying that the men have no other option but death just shows how hopeless all of them are. They see no conceivable way in which they can return home safely. For this reason I don’t think Eurylochus is a hero. Instead of respecting Odysseus and obeying his orders, he instead chooses to rebel and give into his temptations. This is further supported by the fact that he also caused the deaths of the rest of the crew except Odysseus. However, I don’t believe these men should have been punished in the way they were. They were, after all, desperate with no other visible way out of the predicament. Helios, although mad, may have had a bit of an overreaction in terms of his cattle. Thus, while Eurylochus was wrong in telling the men to eat the cattle, and is certainly not a hero, Helios should not have killed all the men who ate his precious cows. Great Job, Matt! You went into great detail about the story with providing excellent analysis. Your writing was also terrific. Keep up the great work! In this mythological tale, Odysseus and his men are stranded on an island where the cattle of Helios graze. Odysseus was told by Circe that if any harm from his men should come to the cattle, that they will all perish, leaving Odysseus to travel alone under strange sails to his home where his wife will be courted and his food eaten. Odysseus, fully accepting and understanding this, very sternly warns his men to eat anything but the sun Cattle until the winds stranding them rolls over. This is enough to convince his men for a while. In the beginning, all is well, as they still have their bread and wine and whatnot, and the men are satisfied. But the wind continues, and their supply dissipates. They then resort to fishing for basically anything edible. This goes on for a while, but there simply isn’t enough to fish so that the men might be efficiently fed. In time, desperation grows. The storm continues with no signs of stopping, and the men have to make a decision. Eurylochus is the first to propose eating the cattle to survive. That leads to the question of whether he was a hero or not. I do not believe he was a hero in this situation, but not because eating the cattle was a bad idea. Rather, it was because he was simply the first to say what was on everybody’s minds. Although it isn’t said anywhere, it can easily be inferred that the men, in their hour of starving desperation, had thought at least once if it was worth starving next to the most divine meat they’ll ever come across. They decide to eat the cattle, and do so, to the great anger of Helios. The wind finally turns in their favor, and they sail out. A grand storm meets them, though, and everyone dies, leaving only Odysseus to drift. Next comes the question of whether the men deserved this punishment. For some, it might be an argument over whether the men should have believed in Odysseus, but their dilemma was of a slightly different nature. Everyone, having grown up in a very religious world and seen for themselves many religious creatures, firmly believe in the gods. That leaves them to decide whether to believe in Odysseus’ predictions for the future. The men show that they do firmly believe this, as Eurylochus says it will be better to die on a full stomach. Nobody doubted that killing the cattle will most likely mean death. But in this stage of desperation, they were left with two options. They have been slowly eating less and less, and the wind showed absolutely no signs of turning in their favor, and even if it did, they most likely would not be able to catch enough fish to properly feed them the rest of the way. They were either guaranteed to die very slowly, but honorably, or have the best meal of their life, and only have a high chance of death. Although they believe Odysseus, they still, in the end, have no actual, solid evidence that what Odysseus says is true. It was satisfaction and probable death or suffering with guaranteed death. And, not to mention, if Helios loved his cattle so much and saw them every day, he would have noticed Odysseus and his crew. Knowing the danger they might pose, he could have bargained for whoever controlled the wind and weather to make the wind turn in their favor. But that makes too much sense for mythology. For today’s classwork and homework, we read The Cattle of the Sun God. In this tale, Odysseus and his men are faced with the hard choice to either die from starvation, or eat the only cattle on the island of Helios. Odysseus was warned not to eat the cattle on the island because Helios loves his cattle, and Odysseus tells his men. At first they listen to him, but soon they become even hungrier and don’t know how to proceed. When they are trying to decide what to do and what is right for the situation, Eurylochus shares with the crew his own point of view. He says, “ ‘Comrades, You’ve gone through everything; listen to what I say. All deaths are hateful to us, mortal wretches, but famine is the most pitiful, the worst end that a man can come to.’ ” Here, he is saying that they have all been through a lot, and death is something they have all dealt with when watching their friends die and it is not at all fair, but they should not die without trying to do something for themselves. Eurylochus, thinks that the worst and saddest way to die is a death from starvation, so he says that they should take the chance and eat the cattle, because if they don’t they will die anyways and the best and easiest way to go in this situation is to eat it, but they will be full and happy. The men decide to go along with him and eat it. This decision angered Helios and he was sure to let Zeus know just how upset he was by their actions. The men were punished and died, as they had already expected would happen. Zeus sent a storm and their ships were ruined. Every man except Odysseus died. Odysseus, although he didn’t take any part in the event was blamed because they were his men and they should have known better than to do what they did and killed his beloved cattle. Odysseus was sent away and punished for seven years because the gods saw the situation as a bad one that he could have avoided. Great job! I liked how clearly you summarized the reading. Keep up the great work! In tonights reading of “The Cattle of the Sun God” in the green literature textbook, Odysseus and his crew are out to yet another challenge. This challenge is starvation. Odysseus and his men go to Helio’s island where cattle are located near them. One day when Odysseus “withdrew to the interior to pray to the gods in solitude”, one of the crew members named Eurylochus, convinces his fellow sailors to eat the cattle of Helios. After finishing all the food that they had, the crew had to decide eating the cattle and starving to death. It would be an easy choice but, Odysseus told the men not to eat the cattle. Driven by the temptation of eating, some men ate the cattle and went against Odysseus’ word. The text states, “ But in the end, when all the barley in the ship was gone, hunger drove them to scour the wild shore with angling hooks, for fishes and sea fowl, whatever fell into their hands; and lean days wore their bellies thin.” This shows how they wanted to follow their leader but they got so hungry which drove them insane and made them eat. If I was put in this situation, I would follow Odysseus’ rule because Odysseus has been nothing but loyal so why should my greety needs need to kill cattle and disobey my trust in my leader. Although I wouldn’t eat the cattle, I can see why people would. Scientific studies have shown that people get angrier as they get hungrier, and the people on the trip were so hungry that they let the hunger interfere with their moral virtues. The people who ate trusted Odysseus but they felt as if they needed to take charge and after all, everyone makes mistakes and Odysseus could’ve heard it wrong. To conclude, Odysseus and his men were put to a serious test which wasn’t easy but showed everyone how you have to have trust and faith. Great blog, Noy! I agree that the crew’s hunger interfered with their decision-making. If they were sufficiently fed, they would have never made that decision. In the story of the Cattle of the Sun God, Odysseus and his crew reach the land of Helios and his cattle. First and foremost, Odysseus specifically instructs his men not to eat the cattle and despite the warning, Odysseus’ men do not listen. There happened to be a storm that day on the island that just made things worse. While Odysseus goes to pray to the gods, one of his men, Eurylochus convinces his fellow sailors to eat the cattle of Helios,“All deaths are hateful to us, mortal wretches,/ but famine is the most pitiful, the worst/ end that a man can come to…. We’ll cut out the noblest of these cattle/ for sacrifice to the gods who own the sky.” (pg. 1011). Odysseus the respected and skillful leader, decides that the cattle must be killed, and the men concur. Soon, Helios finds out and rushes to Zeus, demanding these men be punished for their horrific actions. As a result, Zeus promises to use a lightning bolt on the men who ate the cattle. Zeus sent along a storm right as Odysseus and his men were leaving, ultimately killing every except Odysseus. I personally believe that they got what they deserved because they disobeyed Odysseus’ commands. After the cattle did not belong to them and they didn’t receive permission to eat it. After that, Odysseus is then forced back to Charybdis, which he eventually overcomes, and the island of Calypso, where he will be trapped for the next seven years. Finally, I don’t believe that Eurylochus is a hero, and he was portrayed as a very desperate person, that contrast with Odysseus’ heroic characteristics. Instead of devising a plan and trying to survive without disobeying Odysseus, Eurylochus decides to indeed disobey Odysseus and proceeding to the most desperate act possible. This shows bad leadership skills by Eurylochus that show that is should not be considered a hero. In “The Cattle of the Sun God,” in the Odyssey, Odysseus retells the story of Helios’ kine. As he and his men arrive at a grotto, Odysseus tells them they must not take the cattle on the island for food, or they would suffer greatly. They must only eat and drink what they have on the ship. “Old shipmates, our stores in the ship’s hold, food and drink; the cattle here are not for our provision, or we pay dearly for it.” At first, his crew is eager to obey his command. But as the days wore on, they became hungrier and hungrier as their supplies diminished. Eventually, Odysseus’ crew’s desire for food became unbearable, and Eurylochus decided to convince everyone to slaughter the cattle. He makes a speech, saying that starvation is the worst death someone can die from. He also attempts to reassure those who feared the wrath of the sun god by promising to sacrifice the best of the meat to the gods, and building a great temple for Helios. After all, Eurylochus observed, “Better open your lungs to a big sea once for all than waste to skin and bones on a lonely island!” Odysseus’ men agree, and butcher the cattle. Personally, I don’t think Odysseus’ crew deserves a punishment. If I was there, I probably would’ve done the same. I would rather stuff myself with food and take a risk, than face certain death at the hands of starvation. After all, nobody could know if Odysseus was telling the truth or not. At that moment, it would’ve seemed like a much better choice to eat the cattle. Today in class we read “The Cattle of the Sun God”. This part of the Odyssey tells of Odysseus and his crew being stranded on Helios’ island, with limited food and water. Storms keep them on the island, and soon enough food runs out. Odysseus warns his crew that they cannot eat the cattle on the island, or else they will be punished by Helios. Odysseus leaves his men to go for help from the gods, and Eurylochus, one of Odysseus’ men, tells the crew his point of view on the situation. “All deaths are hateful to us, mortal wretches,/ but famine is the most pitiful, the worst/ end that a man can come to…. We’ll cut out the noblest of these cattle/ for sacrifice to the gods who own the sky,” (page 1011). Eurylochus thinks that they should eat the cattle and accept whatever consequences come after that, rather than die of starvation. This convinces the starving men and they eat the cattle. 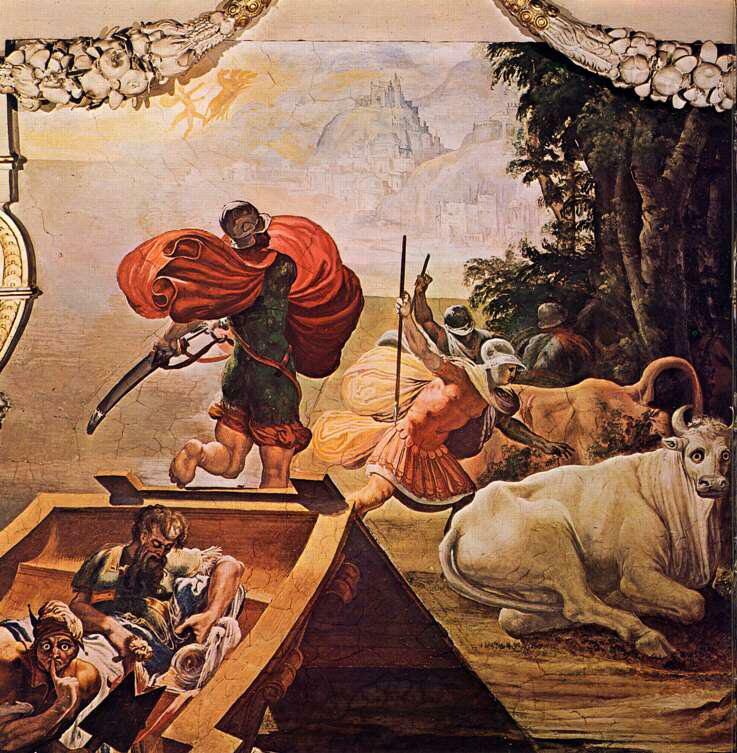 Helios finds out that his precious cattle has been eaten and goes to Zeus so that he can get revenge on the men. Zeus hits the men with a lightning bolt while they are leaving, sending the ship flying, killing Odysseus’ crew, but not Odysseus’-just as Tiresias predicted. Odysseus was then sent to Calypso, where he would be stranded for seven years. After reading this story in class, we discussed what we would do- eat the cattle or not? Personally I would like to say that I would listen to Odysseus and not eat the cattle. After all, he has lead us on this journey, and we made it this far. Everything Tiresias had said has been correct, so it would make sense to follow his path. The only thing is, your brain acts differently when you are starving. It is apparently unimaginable what it feels like to be starving so I really don’t know what I would do in that situation. I agree- I would listen to Odysseus too. Great response Hailey! I really like the quote you used, it fits in well with your opinion. Nice job! I think all of the topics Mrs.Quinson gave us to discuss are good so I will answer them all. Eurylochus persuades the men to eat the cattle despite what Odysseus says to them. While Odysseus is on the interior of the island praying to the gods Eurylochus says to the men “‘Comrades…You’ve gone through everything; listen to what I say. All deaths are hateful to us, mortal wretches, but famine is the most pitiful, the worst end that a mean can come to. Come, we’ll cut the noblest of these for sacrifice to the gods who own the sky…But if he flares up over his heifers lost, wishing our ship destroyed…Better open your lungs to a big sea once for all than waste to skin and bones on a lonely island!’ (pgs. 1011-1012)” He tells the men that it is better to be killed by the gods and drown than to waste away without food. He tells them that they will take the best cattle and make a sacrifice to the gods. The men listen and kill the cattle with him. The gods aren’t happy with Odysseus’s men and punish them. Zeus makes a storm and struck the ship with lightning. The ship falls apart and most of the men drown. The men deserve this punishment because they went against Odysseus’ orders and they ate the god’s cattle. Fate plays a role in many of the events. Fate plays a role in the men’s decision to eat the cattle. They know they will all die anyway so they pick what they think is a less painful way. Also, fate plays a role because Odysseus and his men were bound to upset the gods at one point or another. Eurylochus is not a hero. He goes against his leader’s orders and eats the cattle. Also, he guaranteed the men’s death. Maybe the weather would’ve been better the next day and they would have sailed elsewhere and gotten food. Eurylochus insured the men’s death because he upset the gods. Eurylochus wanting to choose his own death says how he is normal. No one wants to die in the most painful way possible. It also shows how he is accepting fate and knows he will die so he picked the less painful way. In lines 899-902 Odysseus is not heroic. The lines read “‘O Father Zeus and gods in bliss forever, you made me sleep away this day of mischief! O cruel drowsing at an evil hour! Here they sat, and a great work they contrived.’ (lines 899-902)” He isn’t heroic because he blames the gods for his mistake. He made the mistake of falling asleep and leaving the men alone. And he is complaining to the gods which isn’t something a hero does. Helios, who is the sun, makes a speech to Zeus. He says “‘ O Father Zeus and gods in bliss forever, punish Odysseus’ men! So overweening now they have killed my peaceful kine, my joy at morning when I climbed the sky of stars, and evening, when I bore westward from heaven. Restitution or penalty they shall pay- and pay in full-or I go down forever to light the dead men in the underworld.’(lines 907-914)” Helios says that the Zeus need to punish the men or he will go down forever. Zeus hears the speech and replies. Zeus says “‘Peace Helios: shine on among the gods, shine over the mortals in the field of grain. Let me throw down one white-hot bolt, and make splinters of their ship in the winedark sea.’(lines 916-919)” Zeus says that Helios should continue to shine and that he will strike the ship with lightning. From these speeches we learn that the gods will help each other when they need. Odysseus has to go back through Charybdis because he gets pushed there by a storm while he is floating on a piece of wood. This is important because then he gets taken in by Calypso so he will be safe until he journeys back home. There is much controversy in the next part of The Odyssey. Many people believe that the logical thing to do would be to slay the cattle, while others believe that they would have listened to Odysseus. Either way, the men needed to be persuaded enough to disobey Odysseus and feast on Helios’ sacred kine, and Eurylochus knew just what to say. “ ‘Comrades,’ he said, / ‘You’ve gone through everything; listen to what I say. / All deaths are hateful to us, mortal wretches, / but famine is the most pitiful, the worst / end that a man can come to,’ ” (ll. 863-867, p. 1011). “ ‘But if he flares up over his heifers lost, / wishing our ship destroyed, and if the gods / make cause with him, why, then I say: Better / open your lungs to a big sea once and for all than waste to skin and bones on a lonely island,’ ” (ll. 874-877, p. 1012).After Eurylochus’ rousing speech, Odysseus’ men choose to follow him, while Odysseus is taking a nap. In the end, though, the men got what they deserved. I’m not saying this because they killed Helios’ sacred cattle, but I’m saying this because they disobeyed a direct order from Odysseus (but, put in that situation, I might’ve done the same). Odysseus strictly told them not to harm the cattle in any way. “ ‘Old shipmates, / our stores are in the ship’s hold, food and drink; / the cattle here are not for our provision, / or we pay dearly for it. / Fierce the god is / who cherishes these heifers and these sheep: / Helios, and no man avoids his eye,’ ” (ll. 838-842, p. 1011). However, despite it being “Odysseus’ crew’s” decision, much is still up to fate. Odysseus had to lose all of his men. As you may remember, Polyphemus, after being bested by Odysseus, made a plea to Poseidon. Part of his prayer was that Odysseus should lose all of his companions. As soon as this prayer was received, his mens’ death warrants were signed. They were fated to die. Polyphemus’ prayer determines Odysseus’ entire journey home. Eurylochus, however, still chose his own death. He was independent and willing to take his life into his own hands. He was brave, in a sense. Brave enough to not let himself starve to death and dominant enough to control the way he died: satisfied. Brave is a common heroic quality, and Eurylochus was somewhat heroic, but in other ways he wasn’t. He wasn’t brave enough to put his faith in Odysseus, to try to wait to escape the situation. Speaking of not being heroic, Odysseus definitely wasn’t in lines 899-902. He blamed the mistake of his men on the gods for filling him with sleepiness and allowing him to rest at such a mutinous time. “ ‘O father Zeus and gods in bliss forever, / you made me sleep away this day of mischief! / O cruel drowsing, in the evil hour! / Here they sat, and a great work they contrived!’ ” (ll. 899-902, p. 1012). Obviously, Helios is not happy when he hears that his cattle were killed. He launches into an angry speech. “ ‘O Father Zeus and gods in bliss forever, / punish Odysseus’ men! So overweening, / now they have killed my peaceful kine, my joy / at morning when I climbed the sky of stars, / and evening when I bore westward from heaven. / Restitution or penalty they shall pay— . and pay in full—or I go down forever / to light the dead men in the Underworld,’ ” (ll. 807-814, pp. 1012-1013) Zeus, in order to calm Helios, promises to strike Odysseus’ ship with one lightning bolt. From this, I get the feeling that Helios is kind of a spoiled brat. Zeus is like that father who will give the child what they want in order to calm him down. Anyway, we learn that you shouldn’t mess with the gods. If you do, they’ll kill you (literally). However, Odysseus isn’t killed because he never hurt the cattle. However, the winds do blow him back to Charybdis. He escapes Charybdis and instead passes by Scylla. However, Zeus hides from Scylla’s sight. I think the importance of this part is that the gods are forgiving Odysseus (or at least Zeus is; can’t say the same for Poseidon). He never did anything wrong, only his crew, so he doesn’t deserve to die. To conclude, the last part of the first part of The Odyssey was very exciting, filled with important characters and morals. Good job Arjun, however my personal opinion is that Eurylochus was not a hero in any sense of the word. Odysseus’s men grow hungry with little to no food, and ponder killing and eating the sacred cattle despite orders from Odysseus not to. Eurylochus, one of Odysseus’s men, convinces them all to kill the cattle and eat them. He tells them that it is better to die with a full stomach, then risking death unhappy and starving. The other men agree, and they decide to disobey Odysseus and do exactly what he told them not to do. When Odysseus comes back and realizes what his men have done, he is angry. He is very disappointed in his men, but cannot do anything to prevent their fate. When the men set sail, they are met with a number of different problems that eventually kill them all off. Odysseus is now alone, and ends up on Calypso’s island without any of his men. Calypso cares for him and loves him, but he just wants to get home. Eurylochus is the one who finally got all of his men over the top on eating the cattle. He chose his own death, and this shows that he trusts himself and his thoughts and feelings over anybody else’s, even Odysseus’s. He takes control of his own life, and does what makes him feel happy and somewhat healthy. Odysseus, however, is not very heroic in one part of the story. He was asleep when his men sneaky killed and ate the cattle, and is very unhappy about this. He blames Zeus for keeping him asleep for the day, when he really should be blaming himself for not being alert enough to keep track of his men. But, in the end, it were his men who disobeyed his orders, and because of this, they were all killed. In today’s reading, Odysseus and his crewmen are left starving and thirsty in the aftermath of a storm. They are desperate to eat the cattle that Odysseus specifically tells them not to eat. Eurylochus, one of Odysseus’s men, convinces the other men to kill and eat the cattle on Helios’s island. Eurylochus tells them that they are going to die anyways, so they might as well eat the cattle, and die by the gods, not by starvation. The text states, “All deaths are hateful to us, mortal wretches,/ but famine is the most pitiful, the worst/ end that a man can come to.” Euryloches convinces the other men that starvation is the worst way to die, and that they must slaughter the cattle and eat it. While most of the crewmen obeyed Odysseus at first, they have become more and more hungry, which made them even more vulnerable to take Euryloches’s suggestion. Therefore, the crewmen disobey Odysseus and kills the cattle, and eats them. Helio is enraged and immediately demands Zeus to punish them. . “ ‘O Father Zeus and gods in bliss forever, / punish Odysseus’ men! So overweening, / now they have killed my peaceful kine, my joy / at morning when I climbed the sky of stars, / and evening when I bore westward from heaven. / Restitution or penalty they shall pay— . and pay in full—or I go down forever / to light the dead men in the Underworld.’ ” When they start their journey back on the ship, they are faced with Zeus’s punishments, and all Odysseus’s men get killed. All died, except Odysseus. Euryloches had led everyone to their deaths. However, I do think he is a hero. He was not afraid to stand by his own opinion, and speak up. All the other men probably thought about eating the cattle as well, but Euryloches was the first to speak up. He was very brave in a way, not following the crowd, but acting upon his own beliefs. However, he did disobey Odysseus, and so his decision (that everyone decides to follow), was indeed foolish. Overall however, he is very brave. Today we read “The Cattle of the Sun God,” a story from Homer’s famous epic The Odyssey. This story shows how Odysseus told his men not to eat Helios’s cattle, but they were so desperate and hungry, they ate the cattle anyway. This was very different because usually Odysseus’s men listen to him. I think that this was because Eurylochus told all the men, “All deaths are hateful to us, mortal wretches, but famine is the most pitiful, the worst a man can come to.” He convinces them that it is better to die from something else other than simply famine. I think that when you are so hungry, that is all you can think about, it is almost impossible to resist temptation. Honestly, I don’t think the crew members deserve punishment. I can see why Odysseus was mad, because they didn’t listen to him, but can you blame them? They were starving! However, I would not consider Eurylochus a hero. He disobeyed his leader. If I was in their position I probably would have eaten the cattle because when I’m hungry I become a mess. I would have just been so mad and not in my right mind. I was very mad at Odysseus when he basically tattled on the men, definitely not heroic at all! He said, “O Father Zeus and gods in bliss forever, you made me sleep away this day of mischief! O cruel drowsing, in the evil hour! Here they sat, and a great work they contrived.” He was telling Zeus what they did wrong, which was seriously not cool. In all, this was a tough situation since people can become animals when they are hungry. I agree. Humans are animals after all. It is just are natural senses. When we get to the point where we are close to death, we get the feeling to take desperate measures, which is in this case eating the cattle. Today we read the story of how Odysseus’ men killed and ate the cattle of Helios the sun god. The question that I found interesting and in need of discussion was the one about Eurylochus being a hero. For Eurylochus, it depends on how you look at his situation. On one hand, he was the savior of Odysseus’ men because he gave them food so that they wouldn’t starve to death on a miserable island, but on the other hand, he was the one that doomed the men to a certain death. There was one thing that we never mentioned in class, and that was the fact that the Cyclops prayed to Poseidon and asked him that all of Odysseus’ men be killed. Poseidon agreed, so that would mean that whether or not Eurylochus and the crew killed the cattle, they would die before they got home. Either they would die of starvation or by the sea, it didn’t matter. They would die at the end. Eurylochus saw that and told the crew so. “‘Comrades’ he said,/ ‘You’ve gone through everything; listen to what I say./ All deaths are hateful to us, mortal wretches,/ but famine is the most pitiful, the worst/ end that a man can come to./ Will you fight it?/ Come, we’ll cut out the noblest of these cattle/ for sacrifice to the gods who own the sky;/ and once at home, in the old country of Ithaca,/ if ever that day comes-/ we’ll build a costly temple and adorn it/ with every beauty for the Lord of Noon./ But if he flares up over his heifers lost,/ wishing our ship destroyed, and if the gods/ make cause with him, why, then I say: Better/ open your lungs to a big sea once for all/ than waste to skin and bones on a lonely island!’”(1012) Eurylochus saved the crew from dying at the hand of starvation. They died happy and content, with full stomachs, and in that way Eurylochus was their savior. But by leading them to slaughter the cattle, Eurylochus doomed them all. I like what you wrote. I also decided to talk about whether Eurylochus was a hero, but I decided on a different outcome. I understand how you say Poseidon would kill the crew members anyway, but we know Odysseus survives so not all the members die. Polyphemus asks his father to if he doesn’t kill Odysseus’ crew give them a miserable time. I think that the crew already had a miserable time, so if Eurylochus didn’t decide to eat the cattle, maybe the blind prophet’s prediction would have come true and the crew would return home. In this segment of the Odyssey, we see Eurylochus lead Odysseus’s men to commit Mutiny. He does this by stating “Comrades, you’ve gone through everything; listen to what I say. All deaths are hateful to us, mortal wretches, but famine is the most pitiful, the worst end that a man can come to. Will you fight it? Come, well cut out the noblest of these cattle and sacrifice to the gods…”(Pg 1011) This shows how he persuades the crew to commit mutiny. Through eloquence and the logic that it would be better to die all at once, dishonorably, than to have a more painful but honorable death. He uses the fact that his hunger and the hunger of the rest of the crew is, at this moment, higher than the desire to return home and to survive. It’s almost as if Eurylochus convinces the entire crew to commit suicide just so that they may end the pain and suffering for a short time. And yet we may see that Eurylochus may not be the monster that he seems, as he has decided to take his fate into his own hands. He is such a powerful leader that, he is able to lead an entire ship’s faithful crew into mutiny against their captain, even though their captain says they will die if they don’t obey. The mistake that Eurylochus makes is to follow his primal instincts rather than do what he knows is right. This leads him and her crew to their deaths. After reading pages about the cattle of the sun-god there is one main question I would like to ponder. Is Eurylochus a hero? First, what is a hero? Is a hero someone who is selfless or someone who does the will of the gods? I thought originally that a hero is someone who demonstrates selflessness. Those may be the heroes of our world but they clearly aren’t what makes the Greek heroes “heroes”. Many Greek heroes were selfish and weren’t good role models. In fact, you could argue that Odysseus’ selfishness or hubris in needing to get recognized by Polyphemus for his accomplishment it what caused the mess in the first place. According to mythweb.com “In mythology and legend [a hero is], a man or woman, often of divine ancestry, who is endowed with great courage and strength, celebrated for his or her bold exploits, and favored by the gods.” This definition may be arguable, but I believe that it is accurate enough to use to judge Eurylochus. Eurylochus doesn’t have any of these qualities so he isn’t a Greek hero, but is he a hero by our standards? I think a hero is someone who performs an action of selflessness for no reason other than to help someone else. Eurylochus does try and help others. Eurylochus mentions “You’ve gone through everything; listen to what I say. All deaths are hateful to us, mortal wretches, but famine is the worst end that a man can come to (Line 864 to 867).” I don’t believe he shows true heroism because he lacks the selflessness. Eurylochus plan is referred to as “insidious” or characterized by craftiness and betrayal. Like the other men, Eurylochus has been hungry the entire time; but unlike the other men, he is willing to disloyally go against his leader’s orders and condemn everyone to death because of his hunger. If Eurylochus, was truly trying to help others than why would he wait until Odysseus left before announcing his plan? He waits so he can use his devious tricks to convince the weak minded crew members to offend the gods for a short-term goal. If we can learn anything from Polyphemus or the cattle, it would be to never offend the gods, but if you do try and be discrete. Typo “Polyphemus for his accomplishment it what” should be “Polyphemus for his accomplishment is what”. “It should be “is”. In this section of the Odyssey, Eurylochus convinces his comrads to kill the cattle of Helios. First, he says that famine is one of the worst end for one to come to. Then, he says that they will sacrifice part of the cattle to the gods and build a temple to Helios back in Ithaca. If Helios still wanted to release his anger, he said that it better dying in a barren island from famine. The men were convinnced and slayed the cattle. Honestly, I think that the men deserved their punishment. They knew the consequences, yet they did it anyways. In normal circumstances, I would think that Eurylochus was not a hero, but I don’t think these ar enormal circumstances. If Odysseus was a hero when he got them in this situation, I don’t see a difference in calling Eurylochus a hero for choosing a more honorable death for his crew. As we read more about the Odyssey, it would sometimes remind me of the Bible. In this case, it reminds me of the Golden Cattle, when Moses and God told them not to bow down to a statuebut did it anyways. While Moses was on the mountain talking to God, the people got irritated and made a golden cow as God and bowed down to it, which led to Moses finding out and getting very upset. It is a bit odd, especially since cattle seems to be special to gods. Reading the Odyssey is really changing my view in literature. Great analysis! Cattle was and is worshiped in several different religions, and I love the connection you made between the Bible and The Odyssey. Today we read The Cattle of the Sun God from The Odyssey. The mutineer, Eurylochus, disobeyed Odysseus’ rules and convinced his crew mates that dying by famine on stranded on Helios’ island and starving was worse than disobeying Odysseus, eating the cattle, and dying anyways. I do not agree with that, because at least you have a better chance of surviving if you don’t eat the cattle, and you will never be in the golden place for heroes in the afterlife. You will either have a grisly punishment, or be stuck in Erebus forever. Honor is very important, because it represents loyalty and valor towards the captain. Helios wanted Zeus to smite Odysseus’ men, and he did so. Odysseus was not brave when he was whining of oversleeping the time that his crew ate his cattle. Overall, all Odysseus wanted to do was to protect his crew and get home safely. I agree with your statement, on how the men have the chance of coming home, and if they died, they wouldn’t be recognized as heroes anyway. I also liked how you mentioned honor, and respect toward a ship’s captain. Good job! In “The Cattle of the Sun God,” Odysseus’ menace faced with the choice of starving, with unknown fate, or to eat the cattle, with guaranteed death. Eurylochus tells the men that they have been through so many horrors, and that dying due to a famine is the most disappointing cause of death. The men should sacrifice a favorable cow to the sky god. Once the men return to Ithaca, they will build a magnificent temple to worship the god. But if the god Helios is furious over the loss of one of his cattle, and decides to destroy the ship, then the men would be better off drowning with their ship than starving and becoming waste on the island. The men chose to eat a cow, while praying and performing rituals. Odysseus wakes to this and he runs off to pray to Zeus, begging him to forgive his men. Zeus decides to listen to Helios’ rant, and he strikes Odysseus, his men, and his ship with a white-hot bolt. All of the men drown, except for Odysseus. I believe that the men did deserve to be punished like that. This was Odysseus’ journey after all. It was his own mission, and he was the reason that they re still there on the seas. They disobeyed their Captain, and they instead listened to just another crew member that tells them to break the rule. Eurylochus reminds me of the snake in the story of Adam and Eve. Although Adam and Eve knew to not eat an apple from the tree, the snake had tempted them to, and they listened even though they knew better. I believe that Eurylochus is a villain, because he tempted the men knowing that they would die if he let them eat the cattle. But he told them anyway. Of course he must’ve been hungry, but he would rather eat and drown, then starve. Odysseus is not heroic in lines 899 and 902, because he pleads to Zeus for mercy. And he even blames the gods for letting him sleep through the mischief, when truthfully he should’ve been awake guiding his men. Odysseus has to go back through Charybdis because he has to swim through the turbulent waters to reach land, and this shows how he is stronger alone, or that he has become strong enough to navigate the waters after all of his years of traveling. Even though Odysseyeus warns his men that if they it the cattle they will be punished with a brutal death, they do it anyway. Eurochylus is able to persuade Odysseyeus’s crew to defy him and eat the cattle. They’re starving and decide that they’d rather not die from famine. They believe dying form famine is pitiful. I can see where they’re coming from. Why should they believe Odysseyeus anyway. He’s the reason they’re in the situation they’re in, he’s the reason they aren’t able to go home, so why does his advice matter now. Also just because they don’t eat the cattle doesn’t mean they won’t die. They could die from a different monster along the way . I think that Eurochylus is a hero of sorts. He’s certainly not a bad guy. Those men took a chance with death and decided to die a fulfilled death. They chose die they why they wanted. At least they didn’t die from starvation which they viewed as much more painful and horrific and it probably is. I don’t think the crew deserved to die they were simply hungry and using their resources. It’s because of Odysseyeus’s arrogance that they have to suffer, thy haven’t done anything to deserve their fates why shouldn’t they satisfy themselves with food. They simply wanted to rid themselves of the pain of hunger, it’s only human. Anyone would have done what those men did despite their better judgement. Great job Maya! I find it interesting how you bring up that Odysseus is the whole reason that they are in this mess. After reading tonight’s pages, we can really see the desperation of Odysseus’ men were going through. Odysseus firmly told them to eat whatever they wanted except Helios’ cattle. A couple of nights ago, we were told to compare Odysseus to someone or something else. After reading tonight’s reading, he reminded me of a shepherd and his flock. Whatever the shepherd does, one or two sheep will always go astray. And normally, when one goes, the majority goes with also. Similarly, Eurylochus was the first to go astray. He was just the one speaking what was on every one else’s mind. Here these men were starving getting ready to die, day by day, by starvation. On the other hand, there were these beautiful cattle, standing there in the grass, waiting to be devoured. When they make the decision to eat the cattle, Odysseus’ words are the last thought in their mind. I don’t think Eurylochus is a hero because he knew not to the cattle because everyone would die. Therefore, taking the lead in this certain situation imposed everyone’s death. He knew that but he still convinced the entire crew to eat the cattle. However, I don’t think the crew needed such a harsh punishment. They were starving, dying of food, grasping for anything they could find. However, we cannot change mythology. Thus, Odysseus is stuck on Calypso’s island for the next 7 years, losing the thought of his home and his family. In the Odyssey so far Odysseus and his crew reach the land of Helios and his cattle. As warned before Odysseus knows very well not to harm a single cow of Helios or else all his men will die and he will reach Ithaca alone. As he warns his men of this fate the listen at the beginning but soon when Odysseus left to pray Eurylochus persuaded them to eat the Cattle and not starve. Which was a compelling point since they were all nearly starving. He questioned his faith in Odysseus and told the crew that dying with a full appetite is better than dying by starving. Of course the hungry crew gave in and this angered Helios and Zeus. So as a response Zeus struck them with a lightning bolt and killed all of Odysseus men leaving only Odysseus. This punishment that was given to the crew clearly wasn’t deserved by them, but in the end it’s not whether they deserve it or not, but it is how the Gods feel towards them. Oops, I just realized that I forgot to post this last night. Here it is. This story is a great way of showing how the gods can act badly. Earlier we blogged on whether we think the gods were good or nad, and I said that just like man kind, which they are based upon, they have a good and bad side. Everyone has a side that they don’t like, whether you hide it well or not, and if you prefer to be a bad person or a good person is all something that you make up. That is the same way the gods act. I do not believe that Odysseus’ men should have been punished the way they were. They were starving acted deslerate, and surrounded by meat. I believe that Heloise over reacted to his cattle being killed, especially because the men tried to make a sacrifice to the gods before they ate. The gods are odd beings, sometimes you may think that you understand them, and the next they do something completely unexpected. Just like man kind, which the Greeks based their gods upon in order to seem more realistic. —they would rather listen to Eurylochus.